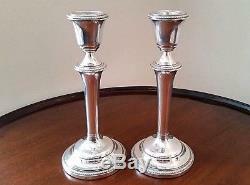 A stylish matching pair of vintage solid silver candlesticks with weighted bases, both clearly hallmarked for Birmingham 1965, with the maker's mark of John Rose (of Hockey Street, Birmingham). The sticks have lovely elegant lines, with tapered stems on circular bases. There is fine decoration to the sconce, shoulder and base. The bases are covered with green baize. Will accommodate candles up to 2.1cm diameter. Overall, they are in a good clean condition. One stick, however, is missing the silver insert in the sconce (still perfectly usable without), exposing the white-coloured filling (see last photograph), and has a small shallow dent in the base (see photos, although difficult to see). The candlesticks measure 8.5 inches (21.5cm) in height, and weigh 789g combined. 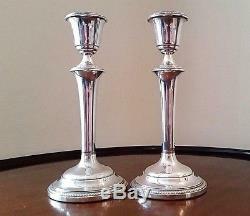 The item "Vintage pair sterling silver candlesticks 8.5 by John Rose Birmingham 1965" is in sale since Monday, December 10, 2018. This item is in the category "Antiques\Silver\Solid Silver\Candlesticks/Candelabra". The seller is "atouchofgold1969" and is located in Cheadle. This item can be shipped to United Kingdom, Austria, Belgium, Bulgaria, Croatia, Cyprus, Czech republic, Denmark, Estonia, Finland, France, Germany, Greece, Hungary, Ireland, Italy, Latvia, Lithuania, Luxembourg, Malta, Netherlands, Poland, Portugal, Romania, Slovakia, Slovenia, Spain, Sweden, Australia, United States, Canada, Brazil, Japan, New Zealand, China, Israel, Hong Kong, Norway, Indonesia, Malaysia, Mexico, Singapore, Switzerland, Saudi arabia, South africa, United arab emirates, Ukraine, Chile.